This Guidebook was created specifically for Educators . 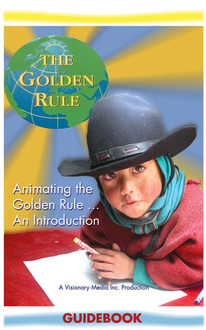 It provides detailed exercises and activities from the DVD movie, on how to create a full day Golden Rule workshop for Youth. 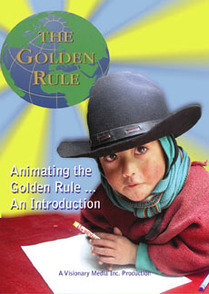 Note: Selected clips from "Animating the Golden..." have been licensed by Nelson Publishing as part of their Teachers Resource Guide for their 2010 World Religion Textbook. 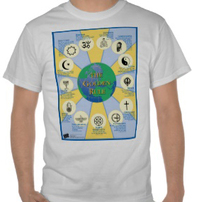 The Golden Rule expressed elegantly on a high quality 100 % cotton T shirt. 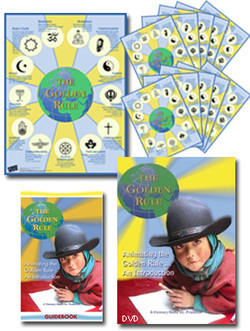 This starter kit provides some basic materials from which to study the core values of the Golden Rule, plus the opportunity to practice exercises from the Educators Guidebook in a group setting. 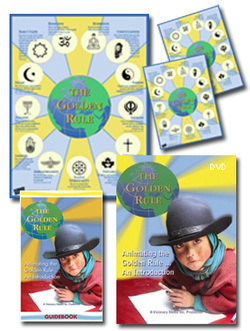 This Larger Kit provides a Church group, Classroom, School or Organization the tools to screen the film to a larger audience, while providing education around the values of the Golden Rule. The group may accept donations to attend their event, in an effort to raise money for their cause.